One of the most important ways to prevent illness in cats and dogs is to spay and neuter them at a young age. We know you have many options when it comes to getting your pet spayed or neutered. When deciding on a spay and neuter clinic, quality medicine and procedures should always be the top factor. But we also know that cost is a big factor in making that decision. When comparing your options for your pet’s surgery make sure you compare apples to apples – or in our case – Labradors to Labradors! We do NOT consider your pet as spay #7. Spay and neuter clinics are able to charge less because they operate an assembly line. 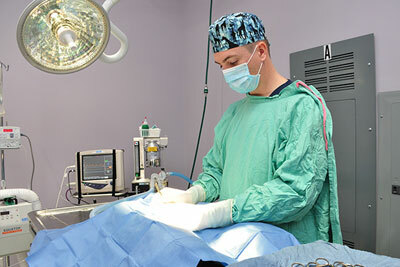 At WBAH we treat your pet as an individual and design an anesthesia program specific for your pets needs. We perform blood work on all pets going under anesthesia. First, it ensures the internal organs are working normally to metabolize the anesthesia drugs we use. Blood work abnormalities may make us choose different medications or even postpone surgery altogether in order to prevent potential complications. Second, if there are any problems during or after spay/neuter surgery we have a baseline of normal before hand to help determine the cause of the problem. An IV catheter is standard for every pet under anesthesia. It’s the best for your pet – and we do NOT charge you for it. IV catheters allow fluids during surgery but most importantly they allow direct access to veins in the case of an emergency. We use Sevoflurane inhaled anesthesia. It is the most modern inhaled anesthesia and considered one of the safest. It is the same quality anesthesia used in human pediatric surgery. Most other veterinary hospitals do not use this. We want to ensure that your pet stays comfortable with minimal pain after their spay/neuter. After this major surgery, we send your pet home with oral pain control medications. There is NO additional charge for medication to keep your pet comfortable. We are happy to recheck any surgery that Dr. Linfante has performed for free. Think the incision looks too pink? Charlie has been licking it too much? Notice a bump in that area? Bring your pet in and we will take a peek and ensure everything is healing well – all with no exam fee! For even more information on our surgical care – take a look at our surgery page. And if you like more than that – give us a call – we would be happy to go over any questions you have!